Our food pantry provides supplemental food for families, children, seniors, and Veterans in our community. We offer non-perishable foods, such as: shelf-stable milk, lunch kits, tuna & tuna helper, mixed vegetables, soups, applesauce and other canned fruit, pancake mix & syrup, baked beans, peanut butter, jelly, cereal, muffin mix, crackers, mac & cheese. We often have toilet paper, paper towel, and cleaning supplies. Produce, dairy, baked goods, and freezer fresh items are also available sometimes. No appointment necessary; a valid driver’s license or state ID card showing a current address are the only documentation necessary. Please share this information with anyone who can benefit from it. Our pantry is free and confidential. All Saints' is a partner agency of the Community FoodBank of NJ. 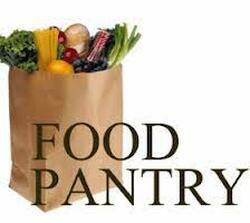 To reach the Food Pantry and schedule a visit, call the church office 908-647-0067. You may leave a confidential message in the Food Pantry voice mailbox #4 and your call will be returned. Our address is 15 Basking Ridge Road, Millington, NJ 07946. Cub Scout Pack 56 – we sponsor the Long Hill Township pack and provide meeting space for individual Cub dens. Boy Scout Troop 56 – we also sponsor the Boy Scout Troop and provide monthly meeting space for the Adult Leaders Planning Meetings. Girl Scouts – Brownie and Junior groups meet here, as well as the monthly community Girl Scout Leader Planning Meeting. As we are getting to know our neighbors and our community better, we are hosting dinners for Veterans in our community about five times a year. Vets from the V.A. in Lyons and from our Long Hill area community are invited. Enjoy a yummy home-cooked meal in our cozy Parish House "bistro", and enjoy conversation and fellowship with All Saints' parishioners and friends. We'll be glad to see you! For more information, speak to Kerrie Stepko or Steve Kowalik. 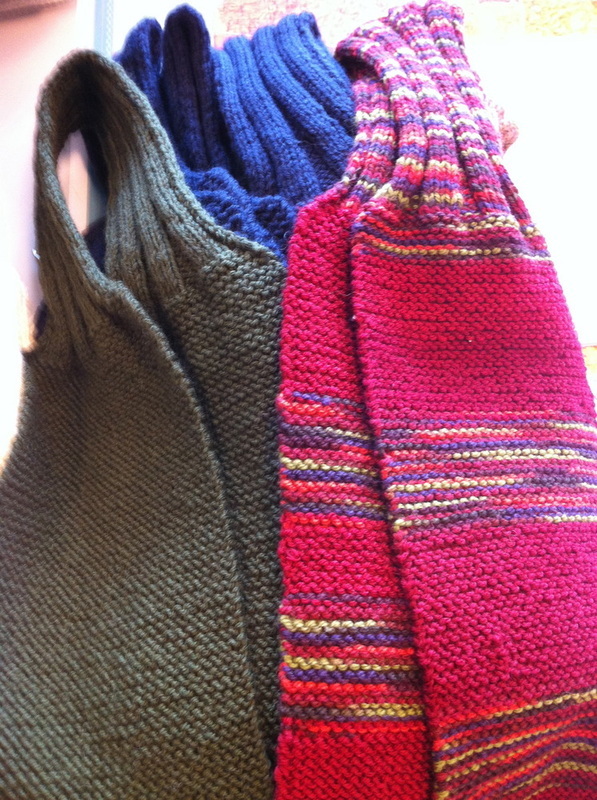 We have several busy knitters who make over 75 hats and scarves to the men at Seamen's Church Institute. This is a small way of saying "thank you" for making our lives more comfortable. We are a small part of the 4,000 knitters from around the country who contribute their time and talent to make over 19,000 hand-knits each year! Join us! 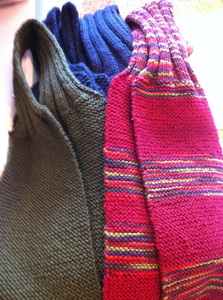 We'll teach you to knit; and you can help others while learning. We would be happy to teach you to knit if you would like! Our annual September event is a great place to find furniture, housewares, small appliances, lamps, tools, dishes, kids toys and games...many different things that you might need; all at very good prices. Watch our home page and Facebook for dates and times. We are part of a group of volunteers at Trinity House/Shrine of St. Joseph with Family Promise of Morris County. We are responsible for one of the days helping the families who seek shelter. Our duties are to provide a days worth of groceries, make & serve a meal, and volunteers to stay the night. Contact Kathy Pfeil or Afsaneh Thursfield to learn more. Our buildings and grounds are always in need of some tender loving care. Interested in extending a flower bed, weeding, painting, organizing; we won't turn you away! Contact Tom Day if you can help out. Driving From time to time, some of our parishioners need rides to doctor's appointments or an a ride to church. Cooking Are you willing to make a meal for someone in need? Soup Making In the winter we make soup on Wednesday nights to take to sick and homebound parishioners. Want to join in? Speak to Babara Barbeau. Let us know if you would like to be on our GO TO list of volunteers. We will call and see if you might be available to help out when needed.